KBH is Leader in Cotton Transport – From the Field to the Gin – Thrakika Ekkokistiria S.A.
KBH has been the leader in supplying cotton harvest support equipment to U.S. growers through the last six decades. Starting with simple cotton wagons in 1949, KBH developed one of the earlier models of cotton module builders and boll buggies in the late 1980s and became a household name across the Cotton Belt. 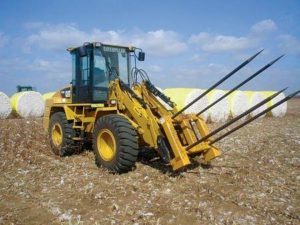 Always ready to embrace new technology, KBH leadership was thrilled when, in the mid-1990s, John Deere asked them to collaborate on putting a moduling device onboard the picker chassis. While no specific products resulted from that collaboration, KBH knew then that the module builder and boll buggy would eventually become obsolete and looked for an innovative way to transport John Deere’s round module when it debuted in 2007. Fortunately, through a few of its many customer friends across the country, KBH became aware of a bale spear being used by a ginner customer. KBH was licensed by the two patent applicants to manufacture, market and sell the Round Module Cotton Spear. Additionally, KBH worked with another ginner customer in Tennessee to develop the Round Module Cotton Transport Trailer, which is designed to transport eight round modules without having to individually strap each one. 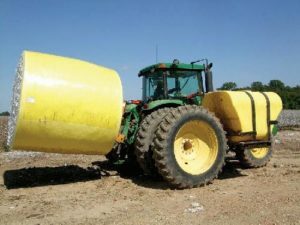 Ten years later, the Round Module Cotton Spear and the Round Module Cotton Transport Trailer have become mainstream in the industry and are being used in every cotton-growing region of the country. Plastic contamination is a major concern in the U.S. cotton industry. The Round Module Cotton Spear reduces contamination risk by spearing the cotton inside of the wrapping. Many competitive handlers grab the outside of the wrap, and sometimes those handlers puncture the plastic. Additionally, they can grab stalks with the module, which can then puncture the wrap. The stalks get transported to the gin where they must be discarded. Round modules that are stuck with a cotton spear don’t bring any stalks to the gin.